The complete volume of the 2017 Monitoring the Future Survey (MTF) teen drug use and behavior survey results is now available online with never before seen highlights about drug use and attitudes among the nation’s eighth, 10th and 12th graders. New information includes teens reporting that vaping devices are nearly as easy to get as alcohol and marijuana, and that they believe parental disapproval of marijuana use is much lower than in previous years. The survey is conducted annually by the University of Michigan and funded by the National Institute on Drug Abuse, part of the National Institutes of Health. Some results are posted in December of the year the survey is taken, with full data sets published the next spring. In this 600-page volume of the 2017 MTF survey results, the researchers present the first-ever national estimates of the availability of vaping devices and e-liquids. Results show that adolescents report vaping devices are easy to get, with 78.2 percent of 12th graders reporting they could get a device fairly or very easily, ranking slightly behind marijuana (79.8 percent) and alcohol (87.1 percent) and just ahead of cigarettes (77.9 percent). The 12th graders also report e-liquids with nicotine sold to be used in the devices are easy to get, with 75 percent reporting that they could get them fairly or very easily. After a 39-year hiatus, the MTF survey once again asks teens if they thought their parents would disapprove of their marijuana use, cigarette use, and binge drinking. In 2017, the survey finds the proportion of 12th graders who do not think their parents would disapprove of regular marijuana use at 13 percent, which is more than three times higher than the four percent average for 1976-1979. Additionally, perceived parental disapproval of smoking one or more packs of cigarettes per day significantly increased to 92 percent as compared to 89 percent more than three decades ago, and parental approval of weekend binge drinking was about the same at 86 percent in 2017, as compared to 85 percent in the late 1970s. For more information about the Monitoring the Future Survey, go to: Monitoring the Future. For more information about e-cigarettes/vaping and marijuana, go to: DrugFacts: Electronic Cigarettes (E-cigarettes) and Marijuana. Miech, et al. 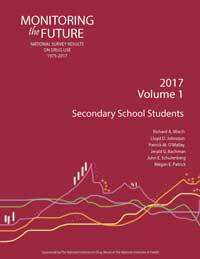 Monitoring the Future national survey results on drug use, 1975-2017: Volume I, secondary school students. University of Michigan. NIDA. "Full survey of annual teen drug use now available with additional data." National Institute on Drug Abuse, 1 Jun. 2018, https://www.drugabuse.gov/news-events/news-releases/2018/06/full-survey-annual-teen-drug-use-now-available-additional-data. NIDA. Full survey of annual teen drug use now available with additional data. National Institute on Drug Abuse website. https://www.drugabuse.gov/news-events/news-releases/2018/06/full-survey-annual-teen-drug-use-now-available-additional-data. June 1, 2018.